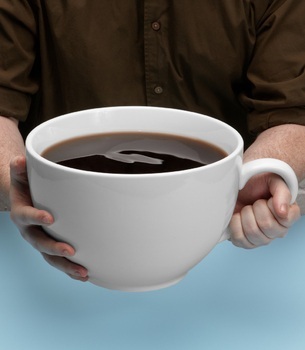 I may drink a lot of coffee, and but I’m not sure that even I drink enough to need the World’s Largest Coffee Cup. This crazy cup can hold up to 160 ounces of coffee – or the equivalent of 20 regular cups! Since the cup doesn’t offer much in the way of insulation, you will need to be a serious coffee drinker in need of a serious caffeine fix to get through all that coffee while it’s still nice and warm. The mug – which would require me to brew more than a full put of coffee in my drip brewer – probably won’t be easy to reheat if that coffee gets cold. Of course, this mug is really a gift item and it is an impressive one for a coffee lover. I would skip the coffee and fill it up with chocolate covered espresso beans to get the impressive effect of the mug and still be able to get a little caffeine out of it (without going overboard! ).